Halloween is a time of year that allows creative homeowners to flex their decorative muscles. It is a fun prelude to the more serious Thanksgiving and Christmas decorations that will be taking place. Halloween decorations are a great way to make sure that we are starting off the decor season in the right manner. Let’s take a closer look at some of the most over the top decorations that you are ever going to see. 1. Walking Dead fans are bound to enjoy this Long Island home’s unique decor. We had to look twice to make sure that we didn’t turn on the television set by mistake! 2. 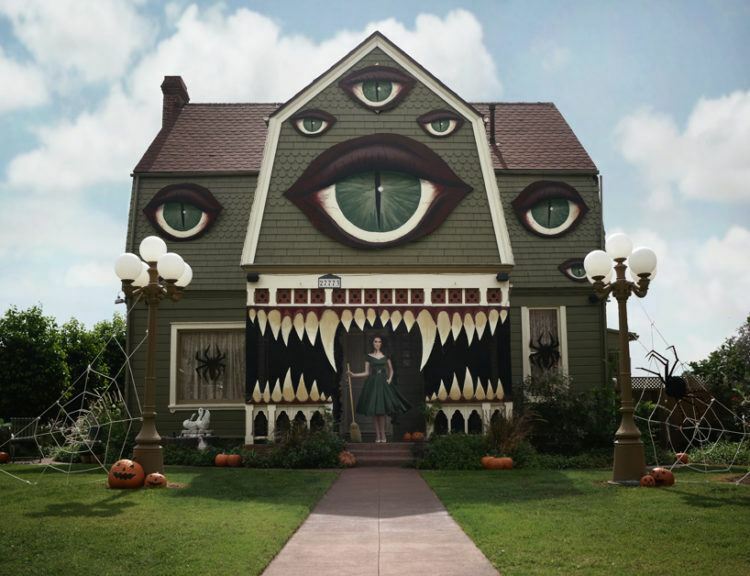 This house looks like it would be able to devour us whole and we’re not going to lie to you. We would definitely still take our chances and walk inside in a heartbeat. 3. When you enter a spooky looking house, it can be a bit of a letdown when the interior is not as cool as the exterior. At this house, that certainly won’t be a problem. 4. There are a number of monsters running amok at this residence. If the Stay Puft Marshmallow Man from Ghostbusters doesn’t get you? The gigantic spiders will. 5. The level of realism that went into creating this eye catching scene is incredible. We just hope that no accidents are caused by all of the rubbernecking that is bound to take place. 6. Why would you ever possibly limit yourself to just one pumpkin when you can have a literal house of jack o’lanterns? 7. We’re not sure what all of these pop stars did to offend these homeowners, but one thing is for certain: we do not like seeing Rihanna’s name on a head stone! 8. Decorations like these make us wonder how big of a flyswatter it would take to bring down this big fellow. Oh well, he’s definitely going to be Animal Control’s problem now. 10. Do you want all of that delicious Halloween candy? If so, you are truly going to have to work hard for it. We do not envy these trick or treaters in any way, shape or form. 11. We aren’t entirely sure how a Kraken ended up dwelling underneath this family’s yard, but we aren’t about to ask too many questions. The same goes for the spiders who’ve managed to live under the sea. 12. All of the creepy looking dolls would be bad enough by themselves. The creepy clowns make this a bridge too far. 13. We had to take a step back from the screen and realize that there was actually no oversize gorillas looking to eat us.